The buzz in the room was palpable. For the first time in history, a company that already has devices in many of our homes (or our hands) teased a product that could, perhaps, pass the Turing test. That product was Duplex, Google’s lifelike new AI capable of handling the type of grunt work you wish you could afford an assistant for. 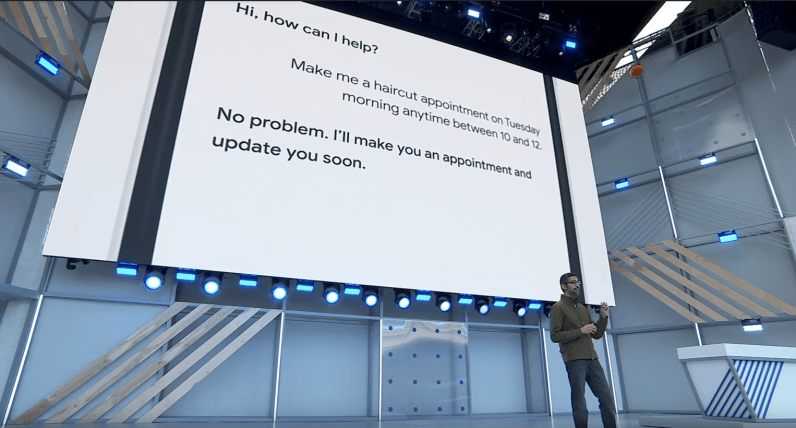 In front of over 7,000 people, Google demonstrated an artificially intelligent assistant making calls to local businesses on our behalf. In this case, it made a dinner reservation and scheduled a haircut. If the person on the other end of the phone knew it was AI, they were far smarter than any of us in attendance that day. But we’ve been down this road before. Hell, we’ve been down this road before at Google I/O. Remember last year? Google CEO Sundar Pichai promised updated AI in Google Photos that would allow you to remove unwanted items from photos. It was the kind of game-changing moment that filled the room with a sort of game-changing optimism offered this year by the Duplex demo. If you take a picture of your daughter at a baseball game and there’s something obstructing it, we can do the hard work, remove the obstruction, and have the picture of what matters to you in front of you. That was a year ago. It’s still not available. It announced its AR effort, Project Tango, back in 2014. It never made a promise to ship the device, as it wasn’t really a device as much as a development kit for other devices. Consumers got their hands on it two years later in the form of a bulky phablet-style phone (see Lenovo’s Phab 2 Pro). A year later Asus announced the Zenfone AR, which would also run Tango technology. Saying it failed to live up to the hype is, perhaps, putting it mildly. The phone was destroyed by reviewers and Asus never tried a follow-up. Google ultimately shuttered the project late last year in favor of ARCore. In 2016, at I/O, Google announced Android apps were coming to Chromebooks by the end of the year. It delivered on that promise but, two years later, it’s still a giant mess. Android apps work on ChromeOS, but it’s an exercise in patience, and one that more often than not leads to finding an alternative made for Chrome instead. Now it’s promising Linux apps. Don’t hold your breath. There was also Lens, a project that mostly works as promised save one major talking point during 2017’s I/O keynote. In a demonstration, Pichai showed a Lens function that allows you to point your camera at text (from posters, business cards, etc.) and copy the text for pasting into an app or a note. It demoed the same functionality at this year’s keynote with a promise it was coming soon. None of this is meant to diminish what Google is doing. Tech is hard. Innovating with tech is even harder. Releasing a game-changing feature or product each year is downright impossible. And while it’s Google’s job to drive the hype train, no one here is getting paid to ride on it. Look, our fingers are crossed so hard they’re beginning to bruise. Every part of our being hopes that Google delivers on Duplex. Furthermore, we hope it works just as well as it did in the demo. But we’re practicing cautious optimism on this one. We’d suggest you do the same.